Edwin Beard Budding invented the lawn mower in 1830 in Gloucestershire, England. Since then the advances in lawn mower technology mean that the consumer has a wide range of options. Browse Lawn Mowers and product reviews on Amazon . Petrol/Gasoline mowers are the practical choice for larger gardens although they do require more maintenace than their electric counterparts. Without the need for an electric cable, a petrol mower can reach parts of a garden that are far from a power source. They are available with rotary blades or with cylindrical blades. Rotary blades are best for long or infrequently cut grass. Cylinder blades are best for fine lawns, regular cutting and a traditional striped effect. Larger models of powered mowers have a drive mechanism for the wheels so that they do not have to be pushed. This saves effort but increases the weight and cost of the machine while also depriving the user of the healthy exercise which is one of the pleasures of gardening. The benefits of hand mowers are that they are environmentally friendly, safe, quiet, cheaper and maintenance free. They are also suprisingly light to push (often lighter than engine powered mowers). However, hand mowers are not so good at dealing with grass that has grown too long or twigs in the grass (raking for twigs before mowing is advisable). 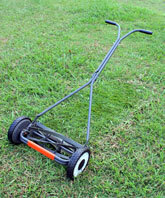 Traditional hand mowers are described as cylinder mowers in the UK and reel mowers in the US - named after the way in which the cutting blades are arranged. The cost is high and you need a small garage to store them, but ride-on mowers have significant advantages: (1) unstoppable power, (2) comfort (3) the reliability of a small car (4) a great appeal to men who might otherwise find reasons to delay cutting the grass. Variously known as edge trimmers, line trimmers, strimmers or weed eaters depending on what part of the world you are in, trimmers are hand held mowers designed to deal with delicate operations that mechanised lawn mowers cannot cope with e.g. near fences and around trees. Cutting Mechanism - Cylinder/Reel or Rotary? A cylinder (also known as a reel mower) mower has a set of between 5 and 8 spiral-cylindrical blades spinning on a horizontal axis and a stationary horizontal blade. This results in a cutting action similar to a pair of scissors. Cylinder mowers produce a very high quality finish and are favoured by bowling greens and show grounds. This cutting mechanism is best suited to grass that is cut frequently and well maintained and will not cope so well with longer, rougher grass. An 8 blade reel is more effective for a tougher lawn. The blades on a rotary mowers spin horizontally on a vertical driveshaft at high speed. Grass is cut by a tearing action. A rotary mower is a good choice if you have a tendency to leave it a bit too long between cuts. So there are a lot of options and the making the right choice requires balancing the pros and cons in light of your personal circumstances.